I am trying out a new hobby... actually an old hobby that I tried again lately, and that is sewing. I learned it more than 15-20 years ago, but hated it. Thought it was so boring, but with little girls in the house I thought to give it another try, and now I like it, so here some skirts I made for the girls. Of course I started with an easy pattern that I found here. However, my trademark will be some hand-sewn beads on each clothing item, an African touch :-). You won't see the details on these pics but there are some beads scattered over Jasmine's skirt and some other designs on Juliet's skirt. I also made a dress for a daughter of a friend of mine, but forgot to take a picture, so that will come later! 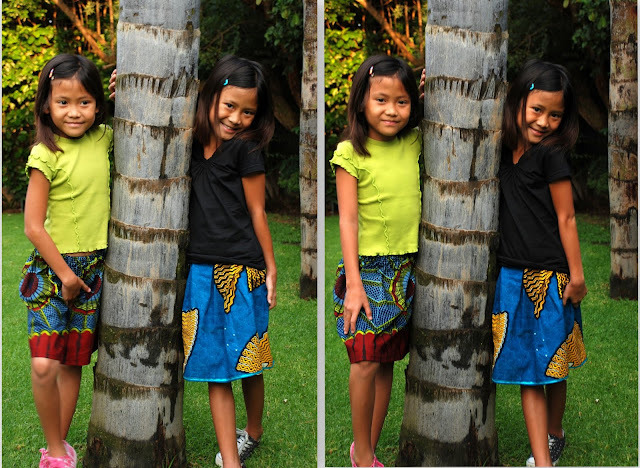 These skirts are made from fabric from West Africa, Nigeria. I love the bright colors and the funky designs on it! 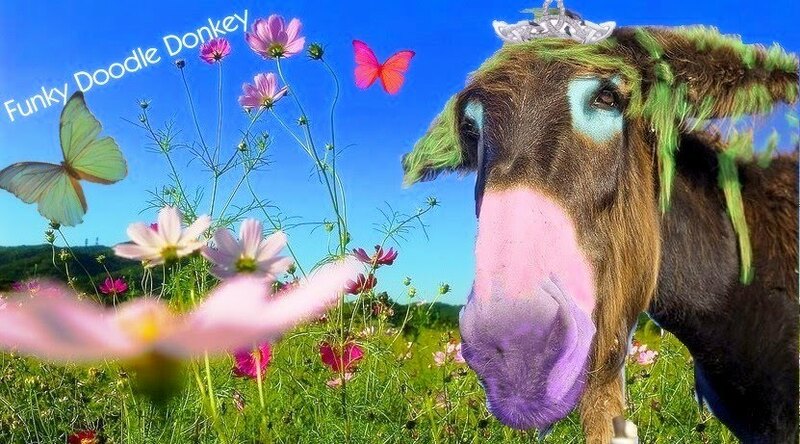 My inspirations I get from these handmade sites like ETSY, DAWANDA and INDIEFIXX, check these out if you are also a lover of handmade stuff, you will love it!! Tell me, what is your hobby, do you like to make things, create something out of scratch... TALK TO ME ABOUT IT! Very good, Mireille, love the skirts and the pattern! Is it hard to get the 'african' materials? Or do you get them on the market? My hobby is still painting. Now we started to do portraits and they are difficult, but I made an African face and it looks like one, LOL! Getting more and more into painting, after I have changed my room to make an 'atelier' after seeing what Ingrid did in her apartment I was so inspired to change everything myself and I did. I started playing the flute again, can hit the music now already, actually preparing to play the clarinet, but its too difficult yet. I was always awful at sewing at school. The projects were boring and because of that they didn't make sense. This led to teachers shouting and me losing even more interest. Shockingly I have chosen to start learning to sew again. Hand sewing though. I do have a sewing machine I bought recently but we're still getting to know each other. I currently make a variety of soft toy patterns I find on the internet and I absolutely love it! well you are braver in I. I would like to like to sew but I just don't. It would be fun thoguth if I did. I will stick to making Maya's hair clips and making and selling bracelets. Mireille, West African fabrics are wonderful. While living in Ghana I collected yards and yards thinking I'd do something creative with it. So far, I've given them away. I have some table cloths and napkins made from them. The designs on some of the fabrics available in the markets show TV sets, mobile phones, car keys, neck ties, light bulbs, computer monitors -- all symbols of modern life and prosperity. Of course, after President Obama visited there last year, fabric with his face on it appeared! Ginster that is great that you are painting so much now and even taking up the flute ~ WONDERFUL!! I have a Nigerian friend who has fabrics for sale, so I am lucky!! Pixibelle, I love your softies, they are cute, and some day you will go near the sewing machine, i am sure! Leah, you are already so creative and I love your ideas!! Miss Footloose, I know I wish I could go there myself and pick some fabrics from the markets in West Africa, but here I have my friend from Nigeria who buys and sells, so I have resources enough. alas, I am not crafty. :( I know, I am probably the only woman in "blogworld" who is not, but I admit it. But I love to buy other people's beautiful crafts! I guess I am artistic in the performance arts way, but not in the creative arts way. I love those skirts, Mireille, darling!